You don't have java! Why don't you get: Microsoft Explorer This year the Ysselmeercontest will be held on Saturday 18 may. The fifth Ysselmeercontest will be held on Saturday 18 may. This contest will aim on contacts on the higher microwave bands. This year the contest will be held on 24 47 and 76 GHz. 10 GHz will no longer be in the contest. Reason for this is to stimulate participants for the 47 and 76 GHz band. 10 GHz can still be used for talkback or first antenna alignment. within reachable distance and will give good opportunities for 24 and higher tests. home stations can make contacts but cannot win in this contest. talkback frequency suggested on 432.350 MHz or on 10 GHz. 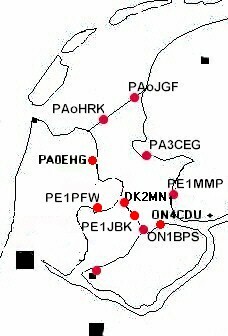 Exchange: Callsign, RST and locator, in the log also the time and distance most be added, logs should be sent to PA0EHG before 18 may. Winners; Each band has a winner with more than two participants. Prize's will be rewarded at the VHF-UHF-SHF meeting.